What is the optimal route to get to a group of locations? And what happens when there is a “disruption” on particular pathways? This workshop examines the amount of time (cost) that it takes to traverse a given network of roads between a series of provided locations. The US Department of Transportation provides nationwide spatial data of our road network. Let’s download their data to use in this workshop, where we will conduct a series of network analyses. For the purposes of this workshop, we will only use the road networks for California. Using the nationwide network would have been preferred, but given that larger datasets take much longer to run “geo” processes, we will first extract the roads for California. Extract the counties for California. 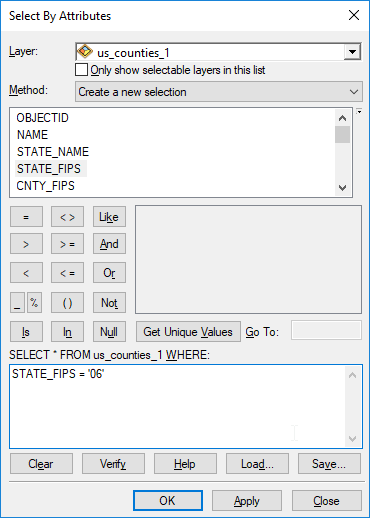 Right click on us_counties, data, export data, and save it as ca_counties in your geodatabase. 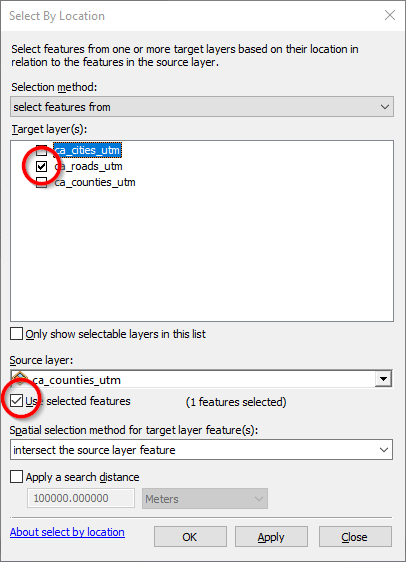 By now you should have a handle on how to filter and create new spatial layers. 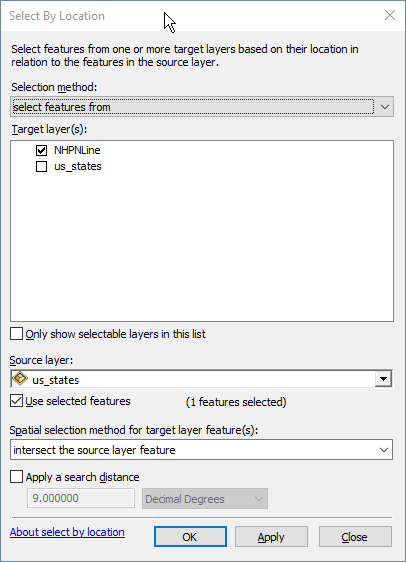 Repeat the steps to generate ca_cities from the us_cities layer. Close ArcMap. There is no need to save the project at this time. Before we begin to create a network dataset, we need to set the correct projection for our project. 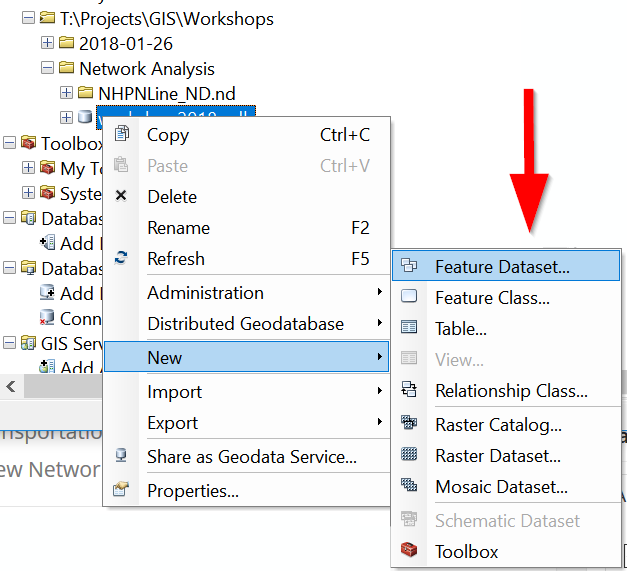 For any type of spatial analysis that requires geoprocessing, it is highly recommended to use a projected coordinate system, and to have every single layer in your project have the same projection. We now have all our data projected and ready to go. But before we do any network analysis, we want to create “cost” fields in our network dataset. Essentially, we want to measure cost as a factor of time. Faster roads, like interstate and freeways, will assume a lower cost of travel (less minutes), while slower roads, like arterial roads, will assume a higher cost (more minutes to travel). Let’s take a look at how the Department of Transportation classifies different roads on the network. The metadata is available on their website here. 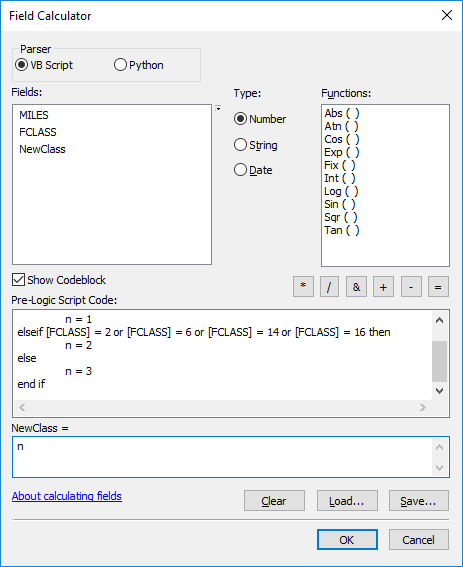 Scroll down until you find the documentation on the FCLASS field. In order to simplify our cost calculation, we will create our own reclassification using only 3 classes. To do so, we will group all freeways and interstates into one class, arterial roads in another, and all the remaining roads as a third class. Add a new field, and name it NewClass, and give it a type Short Integer. Once created, right click on the header, and select Field Calculator. Now let’s assign speed limits to each class. 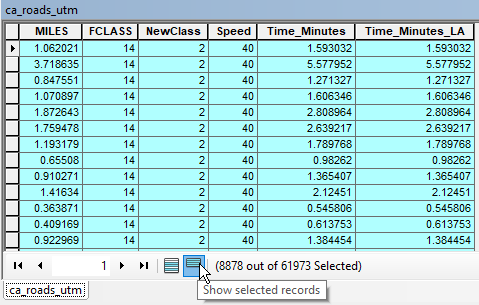 Create a new field, and title it Speed of type Short Integer. 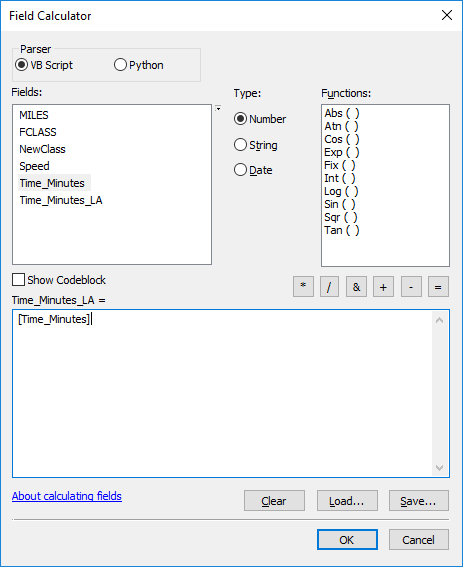 Now add another field, and name it Time_Minutes. Give it a type Float. We have now created a cost field in terms of how many minutes it costs to travel each segment of our network. Let’s presume, however, that a disruption has occurred, and certain segments of our network incur a 10% increase in cost. To make matters simple for our workshop, let’s presume that all roads within Los Angeles County will incur this additional cost of 10%. In other words, it takes 10% longer to travel roads in Los Angeles County as compared to any other roads on the network. Now select only the roads that are within LA County. Go to Selection, Select by Location. 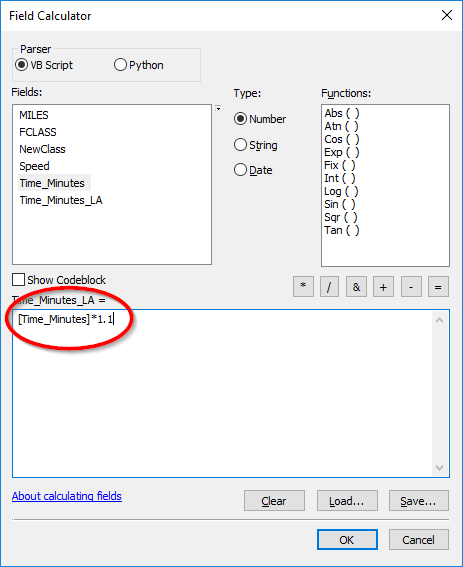 Click on the header for Time_Minutes_LA and bring up the field calculator. We now have two cost fields in our network data. 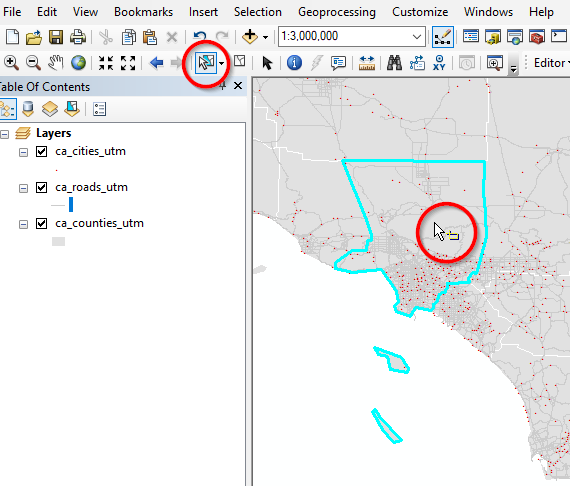 Next, we will create a network dataset that allows ArcMap to run analyses. Open ArcCatalog and locate your geodatabase. Give it a NAD 1983 UTM Zone 11N coordinate system. Ignore the other options, and finish. 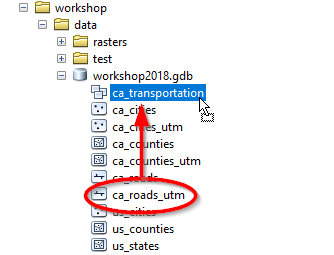 Choose ca_roads_utm as the feature class participating in the network dataset. Choose to model turns in the network. 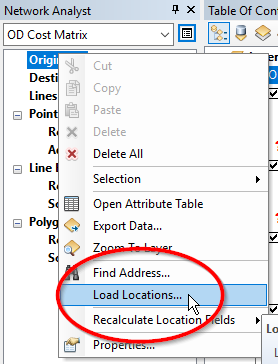 Choose “None” for elevation modeling. Make sure the units are minutes in the dialogue box. 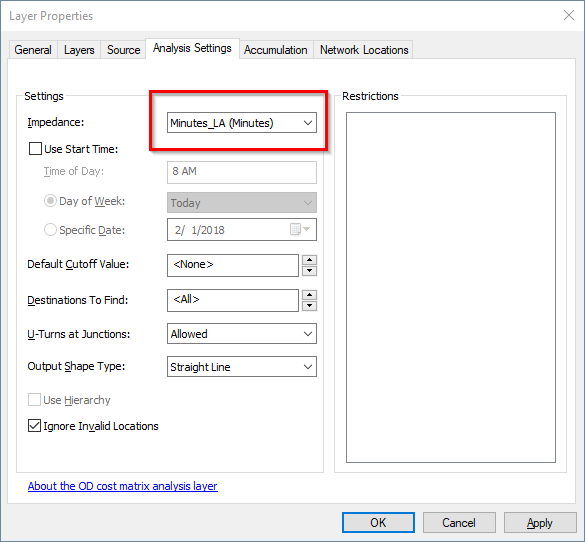 Change the value from “Time_Minutes” to “Time_Minutes_LA”; this will be used to model traffic in LA. Choose “yes” to build the Network Dataset. 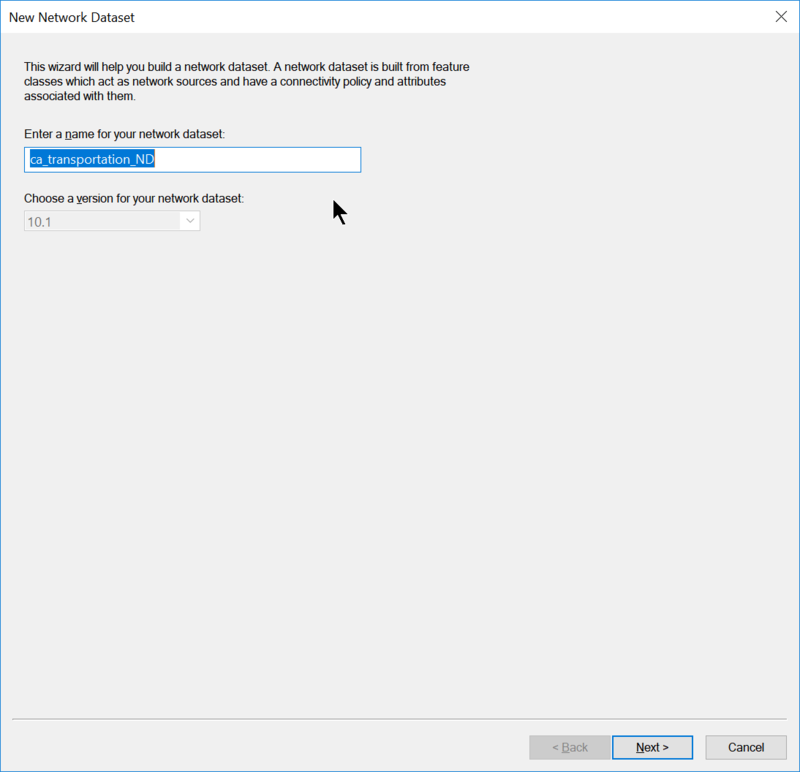 Do not add all features that participate in the network database as we don’t really need them. Go to “Customize” and then “Extensions“. Make sure the Network Analyst Extension has a check mark next to it, indicating that it is on. Our task will be to calculate an Origin-Destination Cost Matrix from the most populous city in California to the next 10 populous cities. 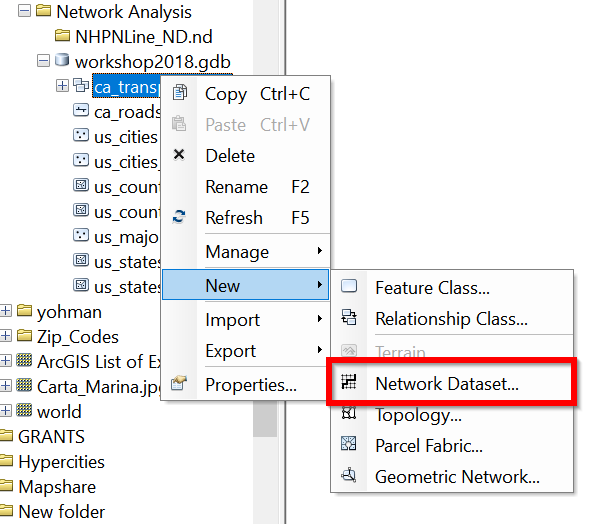 New layers should propagate in both the Network Analysis window and the Table of Contents for the project. 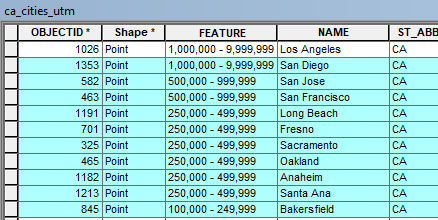 Open the attribute table for ca_cities_utm and order by population_2007. 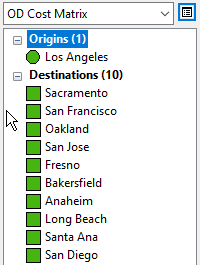 Select the highest value, which happens to be Los Angeles. The Origin-Destinations will be calculated. Right click on “Lines” and open the attribute table for the to see to OD-Matrix. 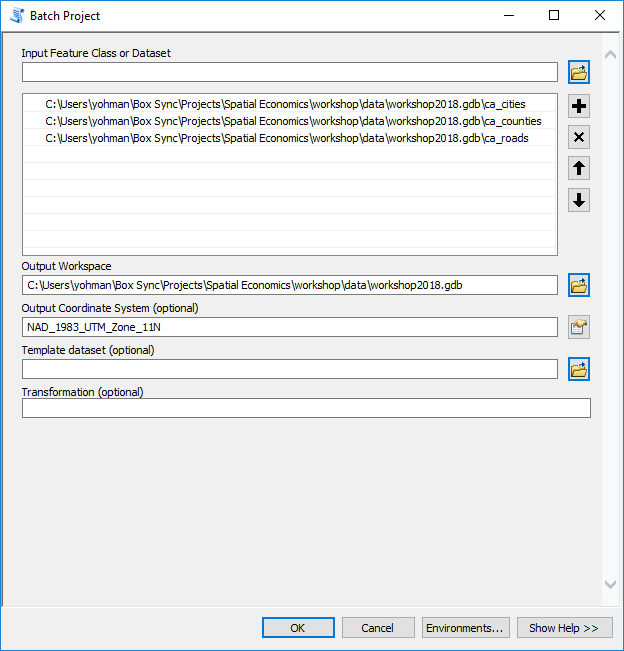 Export as a csv file to save it out of ArcMap. 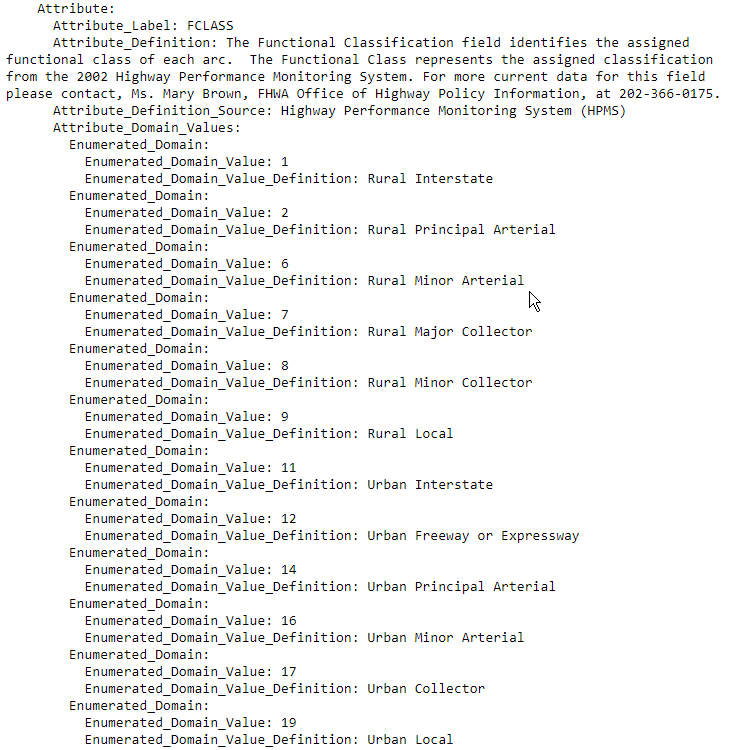 To simulate Los Angeles traffic, we will use the Minutes_LA field. Choose to solve the analysis again. Open the attribute table for the lines. Pop quiz: Travel to which cities have been negatively impacted by Los Angeles traffic? Choose a topic of interest that can be visualized as a county based US map from data that is available on Social Explorer. 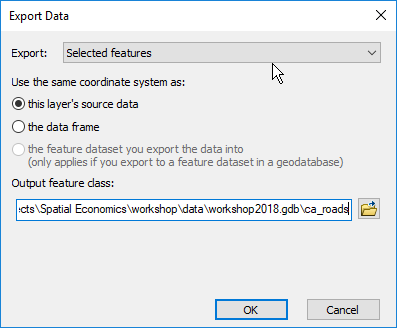 Download your data of choice from Social Explorer, join it to the county layer provided in this workshop, and symbolize it to create a choropleth map. Add a short paragraph description that describes the map. Post your map on this Google Doc. Add a title, your name, your map image, and your paragraph.